Everyone seemed to enjoy the answer to my daughter’s question, “what’s the biggest star?”, so I thought I’d give you another insight into space science at the Cain household. A couple of months ago, we built a scaled map of the Solar System. I thought I’d share my process and resources with you, and throw in a few cute pictures of the kids. So come on, let’s build a solar system scale model in your neighborhood. And for those who might be interested, we also put up links of amazing Solar System collectibles from Amazon.com. Your kids will surely enjoy them! This project happened when I casually mentioned to Chloe that it might be fun to build a scale model of the solar system. You know, some day, when we had time. Chloe and Logan thought it was a great idea, and even though there was half a metre of snow on the ground, it had to happen… right now! We decided that we wanted to put the Sun in Chloe’s room, and then put all the planets to scale, so that we could walk to Chloe’s school (about a kilometer away), and have all the planets fit nicely – we even included Pluto (which will always be a planet in our hearts). 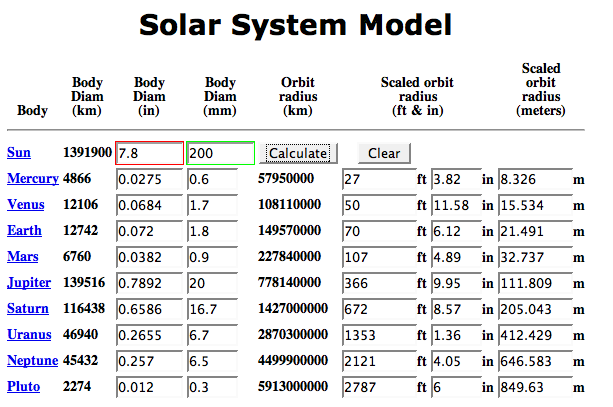 I found a great calculator that lets you calculate various scale model versions of the Solar System. You put in the size for the Sun and then it calculates both the diameters of the scale model versions of the planets, as well as the scale distances. We were really fortunate. A version of the Solar System scale model that fit within the distance from our house to Chloe’s school allowed for a Sun that could be cut out of a single sheet of printer paper. I used a protractor to measure out the circle for the Sun, and then cut it out. While the kids were colouring it yellow, I made tiny versions of all planets. Then we put our mock planets out into their proper orbits using clear sticky tape. With the Sun just inside Chloe’s room, Mercury was at the top of the stairs. Venus was just outside our front door. Earth at the end of our sidewalk. Mars is on a parking sign across the street from our front door. Jupiter is part way down the next block, stuck to a tree. Saturn is on another tree further down that same block. Neptune is on a parking sign 2 blocks further. Uranus is on a fire hydrant. And finally, tiny Pluto was affixed to a power pole just in front of Chloe’s school. If you want to get really clever, you can even put in tiny moons. For example, you could put in the moons of Pluto: Charon, Nix and Hydra. Here are the kids with Mars. Look closer, it’s there. I was fairly careful measuring distances for the inner planets. But then I just made a rough estimate of my stride length, and used that to mark off the longer distances. Here’s a link to a stride length calculator. It’s scary to think that a version of Alpha Centauri at this scale would still be 5804.4 km (3606.7 miles) away. That would require a road trip across Canada. And, now, every day that I walk Chloe to school, we follow the route of our miniature Solar System, and think about just how big the place really is. Even though it’s been a few months since we made our model, most of the planets are still there (we lost Saturn a few weeks back, but we’ll replace it). Have you built a Solar System scale model for a school project? Let me know how it went and send pictures. Maybe I’ll do a follow up with some more astronomy project ideas. For extra credit, get your kids to model some of the recently discovered extrasolar planets. Here’s a page that lists their sizes and distances from their parent stars. With so many hot jupiters out there, you could fill a wall with scale versions. If your kids want to learn more about the Solar System, listen to Astronomy Cast. We did a special tour through each of the planets in the Solar System. Start your tour here with Mercury, then Venus, Earth, Mars, the Asteroid Belt, Jupiter, Jupiter’s Moons, Saturn, Saturn’s Moons, Uranus, Neptune, Pluto, and then the outer reaches of the Solar System. You are 2 smart kids!! U 2 ARE VERY SMART KIDS!! great job! Previous PostPrevious What is the Solar System?